One of the better things about Facebook (as time wasting as it can be) is that occasionally it does hold up something I might otherwise have easily missed. A perfect example of this (for me) was that a couple of weeks ago we could have/should have noted Feb 6 to be a very significant date. For indeed (& this was a shock to everyone I pointed it out to) that day marked the point at which the same number of days had passed SINCE the Berlin Wall had been torn down as it had stood!?! (10,316 days exactly - 13 August 1961 to November 1989 then November 1989 - February 6, 2018). 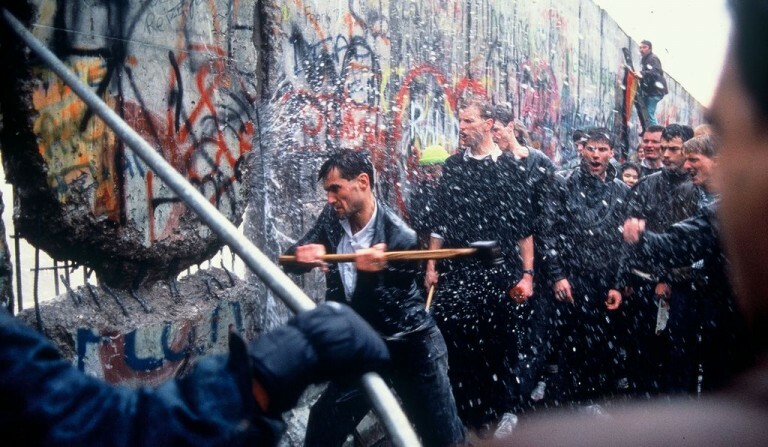 Now if you grew up in or around the years I did, the Berlin wall was really something - something ugly!!! And to be honest growing up through my childhood years & teens (steeped as we were in the “Cold War”) I don’t think I could have dared to dream that a day would actually come when that edifice to anguish would EVER be torn down. The hate and distrust that created that wall were simply too deeply rooted.. too much part of our DNA… ostensibly as impenetrable & un-scalable as the wall itself was. Or so it felt/seemed!?!! And yet suddenly there they were.. images of young Germans - from both sides - straddling the wall ..wailing away at it with sledge hammers; ..images of tearfully older Germans finally embracing family members from whom they had so long been cut off. INCREDIBLE!!?!?! Beyond belief!! More than I could have imagined possible! So amazing that for a brief few years we wondered if we as the human community on earth had not finally grown into a new sense of compassion and new will for peace. Sadly those days of brightness faded all too soon. And once again we know all about walls… a wall separating Jews from Palestinians… a wall to be built to “protect America from ____fill in the blank here____ “. And once more we begin to wonder if we had grown wiser at all.. whether hate and distrust are winning again.. whether there is any chance at all. Once more a generation or two of our kids will grow up thinking walls are normal… & IMPENETRABLE. For me though, that past week’s interesting anniversary is a profound reminder that sometimes things like walls simply aren’t what they seem to be. That as infatuated as we seem to be with walls & the alienation that is intrinsic to them, so too it is clear that our God is just as determined to AND CAPABLE OF tearing them down (Along with every other sort of tower of Babel we might try to erect! … (More on that in our Bible for Dummies Class if you can make it)! The simple fact that in my lifetime.. we have been humbled as often as we have been by God is actually a gift of divine hope. Every time we try to be as destructive of the Kingdom as we can.. something happens that reminds us that there is always more going on than we know or understand. Something happens that need-fully reminds us that God’s will truly is greater than all those arrogantly human things/walls we try to erect. So celebrate with me this anniversary.. this 10,316###sup/sup### anniversary.. this anniversary of the reminder that God’s Kingdom will always find a way - that there really is HOPE! And know that even as we try to build our walls - in whatever form they might come - God is also busy tearing them down.